This week’s assignment is pretty familiar to me, because I’ve Googled myself more than once!I’ve always been a little curious about what information is out there about me, and what results show up first in search results. Because I’ve performed Google searches on myself before, I was well aware of the obstacle of having a common name. 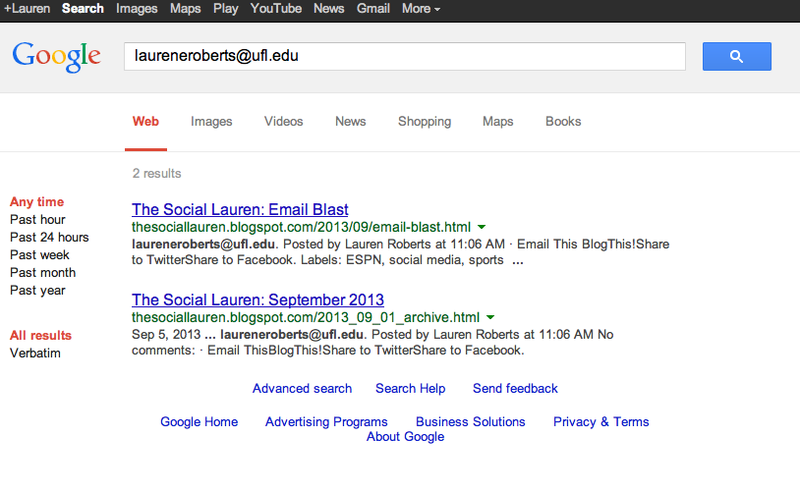 In previous searches, I had to go beyond just “Lauren Roberts” to find results that actually related to me. Putting previous results aside, I Googled “Lauren Roberts” once more to discover if my online reputation had changed, and if I somehow managed to crawl up all of the “Lauren Roberts” results. After searching “Lauren Roberts,” I was very excited when I clicked on the top link which was Facebook profiles for “Lauren Roberts,” and I saw my picture as the top result. Sadly, the excitement didn’t last long. I realized I was still logged into my Facebook account, and that’s why I appeared at the top of the results. I logged out of my Facebook account and conducted the Google search again. The second time, my profile didn’t appear at all. The same was true with the LinkedIn results which appeared as the second result on the first page. 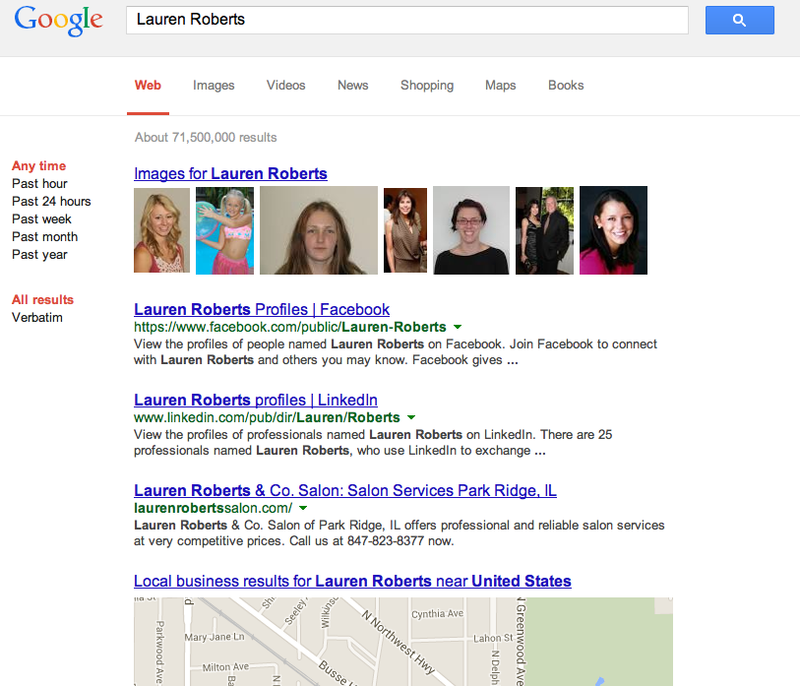 The top results not related to any social network profiles were for Lauren Roberts & Co. Salon in Park Ridge, Illinois; Lauren Roberts, MD; and an article about some woman who threw a surprise birthday party for her husband. I went through 25 pages of Google results, and was unable to find anything that actually related to me. I was surprised to see how many mug shots for people who share my name showed up in the 25 pages of results. I can assure you, none of those are mine! I have several different email accounts that I use regularly, so I decided to perform a search for each of those. I tried my undergrad email “l-roberts@onu.edu” first. Without quotes around the email, a bunch of unrelated links appeared. With quotes, Google was unable to find any results at all. When I typed in my UF email “laureneroberts@ufl.edu,” two results appeared, and they were both links for posts on my Blogger blog. Finally, success! I was surprised that my WordPress blog didn’t appear in the results. I guess I need to post more of my blogs on Google Plus so I might get more recognition. Lastly, I typed in “robertslauren19@gmail.com.” This email also yielded no results. Despite a lack of results, I added several other keywords into the search query to see where I would appear in results. I was very excited that my LinkedIn page was the top result under “Lauren Roberts social media.” When typing in “Lauren Roberts Ohio Norhtern” (where I attended undergrad), I dominated the first page with photos and box scores from soccer games, my LinkedIn page, and some website that tracks people. I don’t know how the last one got my information because I didn’t submit it to them. When I searched “Lauren Roberts University of Florida,” my LinkedIn page was the first result and my Google Plus account appeared on the first page of results. While it’s disappointing that my name alone didn’t garner more related results, it’s good to know that potential employers can still find my online presence if they add several obvious keywords.